Keto Double Chocolate Muffins – Chocolate Lovers! If you’re looking for a delicious breakfast recipe with chocolate, these Keto Double Chocolate Muffins are exactly what you need. Moist, delicious and easy…who knew that a Keto-friendly breakfast could taste this good? I love chocolate. Who doesn’t, right? 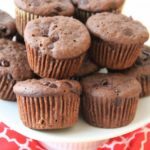 This is why I’m crazy about these low carb double chocolate muffins. The good news? Everyone in my family loves them, too. They’re delicious, easy to make and a fun twist on breakfast or for a unique sweet treat. I like to make this recipe once or twice a month just to change things up a bit for our family breakfast options. And besides waking up to the smell of chocolate muffins is always nice. Talk about one of the most perfect recipes to start the day! Don’t miss sprinkling a couple of Lily’s Chocolate Chips on top. And if you like this recipe, you won’t want to miss out on these! Delicious cut in half with a nice pat of butter on top and a hot cup of coffee. As a dessert, they are delicious with whipped topping or even a spoonful of natural peanut butter. If you and your family doesn’t consume them all in one sitting, you can save them for later! Store them in the fridge for up to 7 days, or in your freezer in a freezer approved bag or container for up to 6 months. Once you’re ready to eat them, thaw and warm up slightly in the microwave. They’ll be good as new! If you're looking for a delicious breakfast or yummy dessert these Keto Double Chocolate Muffins are exactly what you need. Add eggs, cream cheese, heavy whipping cream, Monkfruit Classic, and cocoa to a medium-sized mixing bowl then beat on high until thoroughly combined. Add the melted and cooled butter to batter then mix again. Combine the coconut flour, baking powder, salt, and vanilla with the rest of the ingredients then beat one final time until all the ingredients are mixed together. 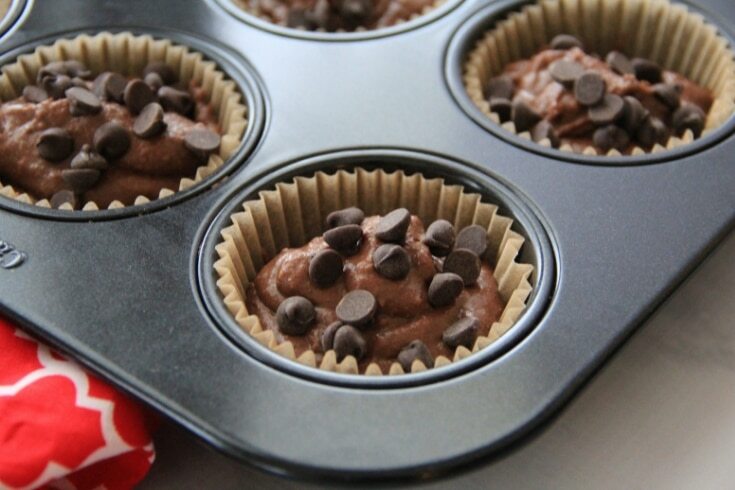 Stir in 1/4 cup of Lily’s Chocolate Chips reserving ¼ cup to sprinkle on top of the muffins. Scoop batter evenly into 12 muffin tins. 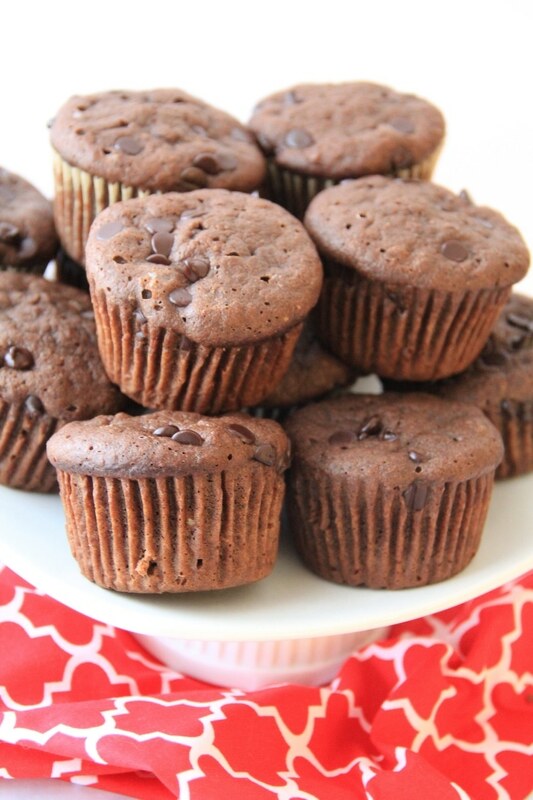 Sprinkle the remaining 1/4 cup Lily's Chocolate Chips on top of each muffin evenly. Bake for 23-28 minutes or until a toothpick inserted in the center comes out clean as baking times may vary due to the differences in ovens. Enjoy! These muffins are best served warm. The sugar alcohols in the Monkfruit are not included in the nutritional information since most subtract to calculate net carbs. Swerve and Monkfruit are interchangeable. Can I use sugar free chocolate chips? Feel free to use whatever chocolate chips you prefer. The Lily’s that I use are sugar free. I don’t have the monkfruit classic on hand, but I do have erythritol. Will that give it a different taste? or do I need to change the amount needed to make the muffins? I would think it would be fine but I’ve only tested the recipe as is. Is it 7g carb PER MUFFIN?? Don’t forget to subtract the fiber that is also listed in the nutritional info to get net carbs. I would use whatever sweetener you prefer. New to keto and will try your recipes. For the cocoa, do you use unweetened? Hi, with the amount of eggs in the recipe,do the muffins have an eggy texture? Hey Jessica, I think the opinion on the texture differs depending on your preferences. My family really likes these and doesn’t think they are eggy. I made these today with a mixture of 1/4 cup coconut flour and 1 1/2 cups almond flour and they were very good. I whipped up some heavy cream, Lakanto Monkfruit confectioners, and vanilla and topped them off. The muffins were cooked in 17 min. I may check at 16 next time. Thank you for your recipe.